KANSAS CITY, Mo. 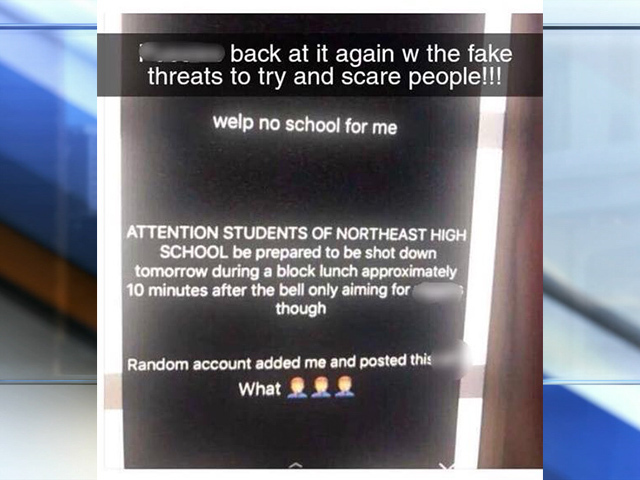 – Kansas City police say a threat made to Northeast High School originated in another state and was then reposted locally in the KC area. Kansas City Public Schools and KCPD said they were made aware of the threat Tuesday morning. KCPD said the FBI is involved in the investigation. Parents shared images of the Snapchats with 41 Action News. One read, “ATTENTION STUDENTS OF NORTHEAST HIGH SCHOOL be prepared to be shot down tomorrow during a block lunch approximately 10 minutes after the bell,” followed by a statement that the poster would only be aiming for black students, whom they referred to using a derogatory term. Another image read, “So excited to see the blood of helpless students as rounds and rounds pierce through the skin of the innocent see all pf (sic) you in a few hours ps not just aiming for students everyone can get some,” in all caps. Kansas City police said their investigation revealed the threats originated in another part of the country, directed against a similarly named school in that region and not against the local Northeast High School. KCPD said that particular threat was then picked up in KCMO and sent out locally. Police said the person believed to have resent the threat here has been contacted and is cooperating with the investigation. The school was operating on normal time Tuesday morning, but extra security was present. School leaders held a security meeting to determine next steps. Spokesperson for Kansas City Public Schools Ray Weikal said the district immediately placed the school on "No Entry" status and increased security around the campus. The school had already been "in the midst of a previously scheduled intruder drill with Strategos, the firm we use to train for those situations," Weikal said. "As always, student safety is our top priority. Our own security team is doing an investigation and we are cooperating closely with the Kansas City Police Department investigators. At this point, we have determined that it is safe to continue with school uninterrupted but with enhanced security."